Older people with type 2 diabetes who are functionally independent should be managed following NICE guidelines. There is widespread acceptance that the management of people diagnosed with type 2 diabetes needs to address issues of hyperglycaemia, high blood pressure and dyslipidaemia in order to reduce the microvascular and macrovascular complications of diabetes. NICE has recently published its draft guideline on the management of type 2 diabetes.1 This guideline will replace the current guideline CG87 published in 2009. Some of the glucose lowering recommendations in the draft are proving to be controversial and have been criticised by diabetes healthcare professionals.2 This is discussed later in this article. The new draft NICE guideline does not address issues of management specific to older people. There is an international guideline specifically concerned with type 2 diabetes management in older people which was published in December 2013 by the International Diabetes Federation (IDF). This guideline is freely downloadable from the IDF website.3 It gives recommendations for older people who are in the categories of either functionally independent or functional dependent with subcategories of dementia, frailty and end of life care (defined as last year of life) and provides much needed guidance in managing older people with type 2 diabetes and other comorbidities. In the UK the prevalence of diabetes across all ages is around 6%.4 Prevalence rates increase in older age groups. In Europe diabetes affects 10–30% of people above pensionable age.5 The prevalence of diabetes in care homes in England is 25%.6 In all of these studies type 2 diabetes accounts for over 90% of all people with diabetes. A HBA1c target of 48mmol/mol (6.5%), at diagnosis and for patients to be on one oral glucose lowering agent. A more realistic target of 53mmol/ mol (7.0%) is recommended when more than one oral glucose lowering therapy is introduced and where drugs that can produce hypoglycaemia are used. The guideline says that targets need to be customised to meet “the complexities of individual patient needs.” On reviewing the evidence for intensification of glycaemic control, the guidelines development group describes clear evidence for reduced risk of microvascular complications and amputations (at least in recently diagnosed patients). They say that “the jury is still out” regarding cardiovascular protection and there remain significant concerns regarding serious hypoglycaemia and its consequences, especially for older, longer-duration high-risk patients. The guidance recommends treating raised blood pressure if it is consistently above 140/80mmHg. The aim should be to reduce blood pressure to below 140/80mmHg or below 130/80mmHg if there is kidney, eye or cerebrovascular disease. The NICE guidelines do not include recommendations for older people who are functionally dependent. Recommendations given in the IDF guideline on type 2 diabetes in older people are given below. In functionally dependent patients the target should be between 7.0–8.0%/53–64mmol/mol. For frail patients it should be up to 8.5%/70mmol/mol and for patients with dementia up to 8.5%/70 mmol/ mol. Patients who are at the end of life symptomatic hyperglycaemia should be avoided. Functionally dependent individuals should be managed to achieve a target blood pressure of less than 140/90mmHg. Those with frailty should have a target blood pressure of up to 150/90mmHg and for dementia patients, a target blood pressure of 140/90mmHg should be attempted. Among individuals with advanced dementia, strict control of blood pressure may not have any added advantage. Unless the blood pressure readings are immediately life threatening, strict control of blood pressure may not be necessary, and withdrawal of blood pressure lowering therapy may be appropriate. NICE guidelines stress the importance of a structured education programme at and around the time of diagnosis, with annual reinforcement and review. They outline the components of this programme and highlight the need for the appropriate training of the educators running the programme. They stress that dietary advice, integrated with a personalised diabetes management plan, which includes increasing physical activity and losing weight, are fundamental to type 2 diabetes management. Older people with no functional impairment should also be referred for structured education and have a personalised diabetes plan that includes increasing physical activity and weight loss. The complexity of the treatment recommendations and algorithms. It remains to be seen whether the draft recommendations will be modified in light of these criticisms. International diabetes guidance, such as those from the American Diabetes Association (ADA) and the European Association for the Study of Diabetes (EASD)7 recommend that metformin is the initial monotherapy of choice for most people with diabetes and that the choice of therapy to be added to metformin should be based on an individual assessment of needs. Issues of risks associated with hypoglycaemia and other drug interactions, disease duration, life expectancy, important comorbidities, established vascular complications, patient attitudes and expected treatment effects and resources and support system availability should influence the choice of second line therapy. A choice from all glycaemic lowering therapy groups may need to be considered. The IDF guideline for older people3 recommends metformin as initial monotherapy of choice unless it is contraindicated through renal impairment or not tolerated. It recommends a range of options for second and third line therapy, but stresses the need to consider therapies with a low potential to cause hypoglycaemia. Consider appropriate withdrawal of therapy, including insulin, in the terminal phase. The NICE guidance recommends first line antihypertensive therapy with a once daily generic angiotensin-converting enzyme (ACE) inhibitor. If there is continuing intolerance to an ACE inhibitor, substitute it with an angiotensin 11–receptor antagonist (ARB). An exception to this are people of African or Caribbean family origin who should have either ACE plus diuretic or a calcium channel blocker. If the person’s blood pressure is not reduced to the agreed target with first line therapy, add a calcium channel blocker or a diuretic (usually a thiazide). Add a calcium channel blocker or diuretic if the target is not reached with dual therapy. The IDF guidelines3 have similar recommendations. If blood pressure lowering therapy is considered necessary, ACE inhibitors and ARBs remain the medicines of choice. Other lipid lowering therapies (fenofibrate, bile acid binding resins, ezetimibe, sustained release nicotinic acid, concentrated omega-3 fatty acids) may be appropriate in some individuals failing to reach lipid targets or intolerant of conventional medications. Niacin should be avoided in older people with diabetes. Lipid lowering therapy is not usually necessary in the last year of life and withdrawal of therapy may be appropriate. Older people with type 2 diabetes who are functionally independent should be managed following NICE guidelines. New NICE guidelines have recently been published in draft form1 and their recommendations for glycaemia, and blood pressure are outlined above. The glucose lowering section is being criticised. The final guideline is due for publication in the summer of 2015 and it will be interesting to see if the draft will be modified in light of comments made. Older people with functional impairment, frailty, dementia and who are in the last year of life have specific recommendations for management outlined in the IDF guideline3 and which are outlined in this article. If these recommendations are followed it may require that older individuals with functional impairment are excluded from Quality and Outcomes (QoF) clinical indicators on the basis that the QoF targets are medically inappropriate in people with these specific disabilities. 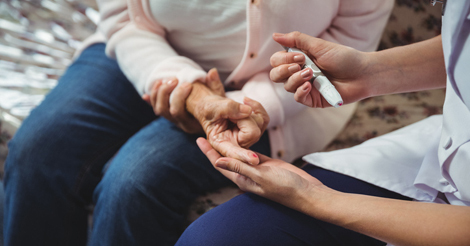 If the recommendations outlined in this article are put into practice, older people with diabetes should be managed more appropriately.